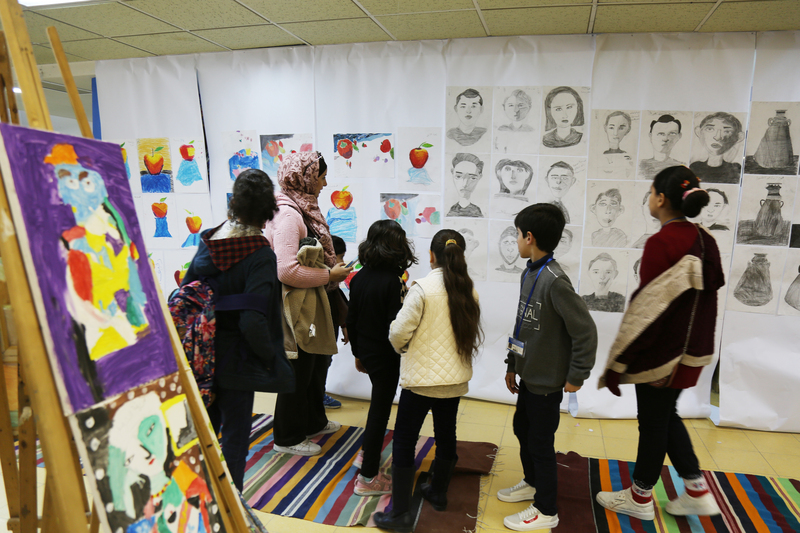 On 22 January 2019, the Child Centre – Gaza (CCG) / A.M. Qattan Foundation inaugurated the exhibition of art products created in the Winter 2019 courses. The exhibition attracted a large audience, including parents and children. The exhibition featured products of art courses, including Drawing with Charcoal Pencils, Printing on Glass, Clay Sculpture, and Colouring Art. These art courses were delivered by the CCG during the Winter 2019 events. The exhibition also included art works produced by children of the CCG Little Painters’ Club during the winter break at the CCG. Together with his peers, Al-Kahlout also participated in a collective art work, producing a glass mural. Artistic elements of the mural illustrate a beautiful scene of heritage Palestinian cities. Al-Kahlout’s mother highlighted how much her son benefited from his participation in CCG courses over the past years. She stressed that the CCG provides a breathing space for Gaza children, where they express themselves and demonstrate their creative potential. Wa’d al-Bayyari explained her painting, which she called Time, to visitors. During the winter break, Wa’d created her painting in the context of the Little Painters’ Club sessions. Having recently joined the Little Painters’ Club, Mohammed Mahdi, 14 years old, said he was so happy that he participated in an art exhibition for the first time. Mohammed made a presentation on his first painting while he held it in his arms. The CCG offers children the opportunity to have many experiences, which shape their awareness of art, unleash their potential for creativity and innovation, and satisfy their curiosity and passion for imagination. To this end, the CCG organises a wide variety of art activities, courses, and programmes all year round. These are tailored to enable children to produce art works, including painting, colouring, and sculpture, and contribute to cultivating children’s appreciation of arts which use different means of production. The art exhibition is held at the CCG premises until 24 January 2019.